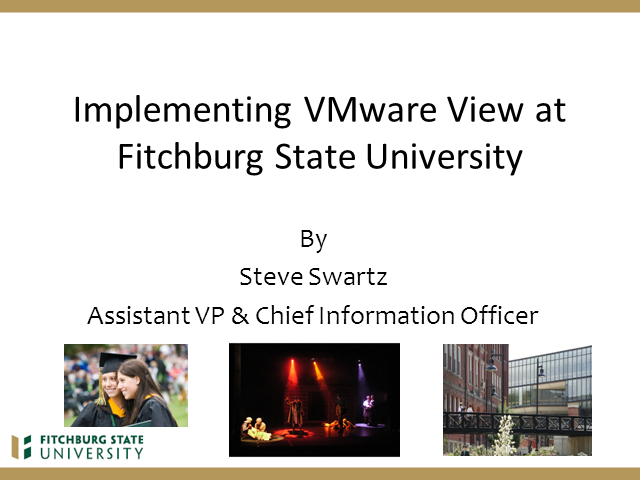 During this presentation, you’ll learn what problems Fitchburg State University hoped to solve by turning to desktop virtualization and why they chose VMware View as a solution. Learn how they implemented thin-clients and virtual desktops on campus, as well as what their future plans are to expand usage. If you work as an IT Service and Support professional in higher ed, you are all too familiar with the challenges of the profession. Students, staff and faculty that need help…right away! Staffing and knowledge management challenges that accompany a student support model! Classrooms, dormitories, technology hubs, and administrative offices spread over a wide geographic area! And a huge variety of devices and equipment that require on-demand support! The simple fact is this…You have the most demanding job in the service and support industry…period! To learn best practices in Service and Support for Higher Ed, register NOW for this first of its kind MetricNet webcast! Fires. Storms. Floods. Attacks. When you think of disasters, you may think of the headlines in the news and the pictures of communities recovering from misfortune. But think for a moment of how much your school depends on its technology and how much smoother the return to normalcy could be after a disaster if you had the peace of mind that your school's data was protected, backed-up and recoverable. That's one less worry. Join us for Microsoft Azure for Disaster Recovery in Education to learn how to have a strong disaster recovery solution in place in case the worst-case scenario happens. Learn how Microsoft Azure can help you eliminate the need for investment in expensive backup datacenter or hosting-based disaster recovery solutions. Plus, learn more about how a disaster recovery plan and assessment by SADA Systems, a Microsoft U.S. Education Cloud Productivity Partner of the Year ensures that your organization is prepared for the unexpected before it’s too late. With budget and resource constraints, school districts like yours are looking for innovative technologies to help manage their computer labs, replace antiquated desktops, and enable BYOD and home access for students and teachers. Rescue Union School District faced the same challenges and designed a strategy with VMware to achieve an available, scalable and cost-effective desktop infrastructure. Simplify and reduce tech support issues for apps and hardware at remote sites thereby reducing onsite tech staff visits. Quickly enable flexible, secure learning environments for on-line testing, Labs, mobile, BYOD and remote students and staff. Easily & affordably implement central management of OS & App upgrades on end user devices, including iOS, zero clients, Chromebooks, laptops, and more in multiple labs and campuses. The education sector is always looking at new technologies to enhance student learning, increase efficiency, drive down costs, improve safety, and expand services. For K-12 school districts, reliable network connectivity is more important than ever before. Districts have discovered that 4G LTE networking solutions provide the reliability, affordability, scalability, and security necessary to fit their student-centered goals. From on-campus primary connect and in-vehicle solutions to business continuity and digital signage, schools and students are reaping widespread benefits from the flexibility and constant uptime that 4G LTE provides. These days, every aspect of educational development creates digital data. Students, faculty, and staff are continually creating files for assignments, lectures and lesson plans, lab and field research, plus the administrative “paper trail”, challenging you, the IT manager, to secure, protect, and manage the growing data sprawl. Schools are just as susceptible to security breaches as other organizations and must comply with stringent data privacy regulations, all while supporting a diverse and constantly changing user base. These days, IT managers are challenged with the task of successfully securing, protecting and managing the growing data sprawl across all industries. In this webinar, hear a unique perspective on how digital data affects the educational sector and how it measures against other verticals. RISC Networks & CDI Computer Dealers Inc. This webinar details a survey of the top 5 IT infrastructure performance issues in the education vertical. We will share how education institutions can evaluate and evolve their network infrastructure performance and get the most out of their IT applications and assets. Understanding and evaluating your IT environment can have a positive impact on the education environment, which results in a positive experience for educators and students alike. This webinar will also address the benefits of conducting IT infrastructure analytics to identify and solve these issues within your environment. This will help IT leaders understand their IT environment, get problem and issues under control and help plan for IT change. This presentation will co-presented by RISC Networks and CDI Computer Dealers Inc.
One of the biggest concerns for IT professionals today is finding a Disaster Recovery plan that isn't going to break the bank. Join this webinar to hear best practices in implementing an affordable and easy-to-use Disaster Recovery option for your VMware production environment and discover the latest technologies that can provide continuous and asynchronous byte-level replication over any distance between your primary and secondary locations. Learn about free security books for teachers, topics taught in technology classes, topics students like the most, cell phones and drama, and why "the talk" about technology needs to start at home. A Call to All Teachers -- thanks to Microsoft sponsorship, McCarthy's book Digital Drama is available for free download on Amazon.com (September 24th - 27th) in English and Spanish. Join in on our talk and learn how teachers are using these free resources to educate the next generation workforce. Taft High School in Chicago is one of the schools leading the pack by creating lesson plans and teaching their freshmen important safety measures. For example: how to create safe passwords, how to configure a secure Facebook account, antivirus installation and software updating, responsible posting for ALL devices, antibullying, and Internet safety. Staniec will talk about how they use the free books to create lesson plans and teach Internet safety and security in the classroom. Ask yourself: are your students ready to hit the ground running when it comes to security and entering the professional world? If Cloud and Virtualization monitoring seem straightforward and not that big a change from what was done a few years ago, think again. These technologies add complexity that requires more than simple monitoring techniques. Join this webinar to learn what complications can arise from these technologies and why everything you ever learned about monitoring needs to be changed. Find out how teachers, students, and schools can use a free security book, OwnYourSpace: Keep Yourself and Your Stuff Safe Online to teach teens effective Internet security in a Q&A with Linda McCarty and Fran Staniec. Staniec will talk about how they use the free Own Your Space books to create lesson plans, learning about security. Ask yourself: are your students ready to hit the ground running when it comes to security and entering the professional world? Join in learn how to engage students. See you on the 24th!!! We are on the cusp of important changes in schools today. There is an national effort to update and unify national standards with the Common Core State Standards. With the advent of the tablet, we are finally seeing a computing device with a form factor and price point that opens up important possibilities in classrooms. More importantly, schools must change or face losing millions of students due to a level of disengagement not seen in generations. There are real opportunities out there to bring important ideas up close for kids in ways not previously possible. This talk will review the central issues and highlight specific approaches centered around technology and 21st century skills. With mobile devices becoming more prevalent in the classroom, it is no wonder that many educators are looking to these devices to improve the learning environment. Add a flipped classroom strategy, inverting the traditional teaching methods by delivering instruction online outside the classroom and moving "homework" into the classroom, and there could be huge potential for learning and growth. But firstly, we have to solve how iPads, or other mobile devices can transform the classroom and what if a flipped strategy was also applied. In this webinar, we will discuss these two key issues in three essential questions: why integrate iPads, why the flipped model and how these two things go together to create a dynamic learning environment. Tune into the webinars in this BrightTALK Channel for the latest best practices and analysis of education and technology. The content is specifically created for education IT professionals and administrators in the education sector for the advancement of infrastructure and learning.